For the perfectly cooked roast leg of lamb, one of the best ways to cook it is with this lamb in a blanket recipe. It may seem an odd way to cook any meat, but it's based on a cooking method from days gone by where the meat is wrapped in hay and given a long, slow cook. It produces a juicy, butter-tender roast lamb. You will not be disappointed. Serve it with a delicious gravy, ​fresh mint sauce, and some crunchy roasted potatoes. The success of this recipe depends on using good-quality, fresh meat and starting the recipe with the meat at room temperature. If your meat has been in the refrigerator, remove it for at least one hour before cooking. Note: while there are multiple steps to this recipe, this lamb dish is broken down into workable categories to help you better plan for preparation and cooking. Heat the oven to 455 F/230 C/Gas Mark 8. 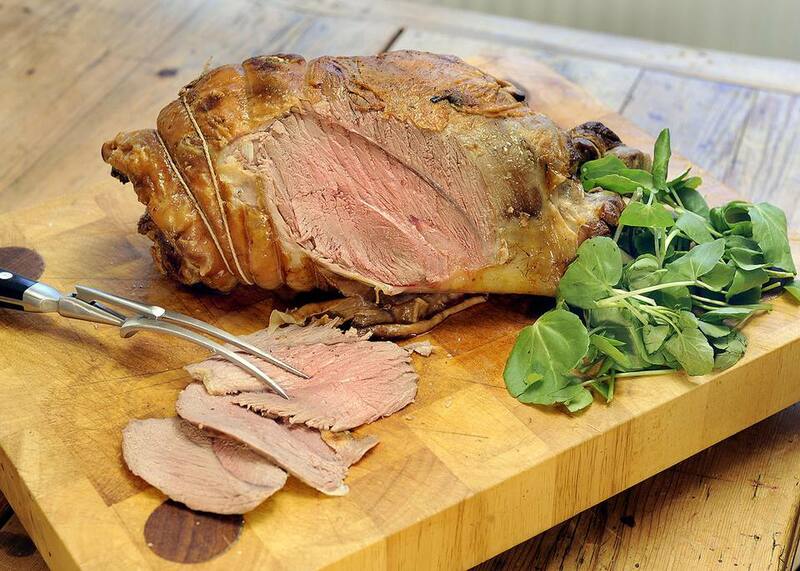 Lay the leg of lamb on a chopping board with skin side up. Using a sharp knife, make approximately 20 tiny slits into and under the skin taking care not to cut into the meat. Slide a slice of garlic into each slit, pushing it well under. Place the lamb, skin side up into a large roasting pan and rub the olive oil all over the surface using your hand. Sprinkle generously with sea salt and black pepper and place into the hot oven, uncovered for 55 minutes. The heat of the oven will cause the fat to melt and sputter and there also might be some smoke but rest assured, this is quite normal. Remove the lamb from the oven, taking care as the pan and the meat will be very hot and the fat may still be sputtering. Lay the rosemary sprigs on the lamb and immediately, wrap the entire pan and lamb with 3 layers of aluminum foil. Then wrap the whole package with a thick blanket or several large, thick bath towels. Place the package somewhere warm but not hot and leave for 6 hours (for rare) or up to 8 hours (for medium-rare to medium). The lamb continues to cook slowly in its thick wrapping using the residual heat and steam from the meat, bone and roasting pan. As it cooks really slowly, the lamb softens and releases lots of juices to use later for the gravy. After your chosen time, unwrap the lamb and remove it from the roasting pan onto a carving board and cover again with the foil. Place the roasting pan on the stovetop over high heat. Once the juices are bubbling, add the red wine and stir well. Turn the heat down and let the sauce reduce. Meanwhile, mix the flour and butter together to form a paste. Once the sauce has reduced and thickened slightly, turn up the heat and add the flour paste and whisk until all the flour is absorbed and the sauce has thickened. Season with a little salt and pepper to taste then strain into a warmed gravy pitcher. Carve the lamb and serve immediately onto hot plates with a little gravy and fresh seasonal vegetables. If the lamb is too undercooked for your taste, after carving, place the lamb slices into a hot oven for a few minutes but no longer than 5 minutes or the lamb will start to tighten up and become a little tougher.